I remember fully believing that the business cards themselves proved my legitimacy. And, sadly, I have done this at least 5 to 555 times. New endeavor? New box of cards! Change of medium? More new cards! They mean I really mean it, right? I handmade my cards in the 70s, each one lovingly inked and water-colored. Personal. Artsy. So labor-intensive I did not really get to the art. In the 80s, I scaled the corporate ladder and was issued new cards for every promotion and different bank I represented. Commercial-Loan-Officer-Wannabe-Artist, at your service. In the 90s, I drew a crane graphic (last name Crain!) 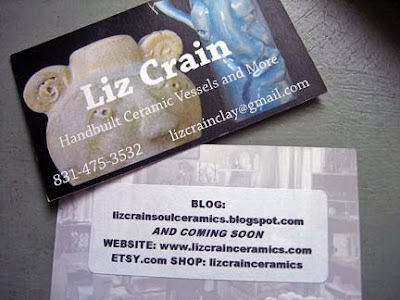 and printed them on ivory Avery tear-apart bizcard sheets. Cheap, but rough-edged and flimsy. Fortunately only seen by a few. I also had boys to raise. Need flash cards for your times tables? Use the backs of those old cards! How about a bookmark? A glue holder? A flip book? Something to clothespin on your bike to make your spokes rat-a-tat? A House of Cards? Here…use these. Yet it finally has worked the other way round: I am an artist because I make art. Oh, and I guess I could probably use a biz card instead of writing on paper scraps and trying to accurately recall all the ways you can contact me or see my work/words online now. Never mind the phone and street address. For the past few years, I have printed a small run of cards to match my annual Santa Cruz County Open Studios Art Tour postcard. That felt right: it featured fun recent art and my name, phone and email, all on the front. And last year’s card, as you can see, even had a ‘halftone screen’ of my studio on the reverse, which I used for titling/pricing in my exhibit. I thought it was pretty innovative at the time. So much has changed in the past year, I feel like an adolescent who has grown two inches in two months. Last July I added a sticker to the back of my old cards (better than using them for flash cards) but even it was out of date sooner than I planned. The “website” will now be this blog migrating to (shhh!) WordPress…and the Etsy Shop is now open with even a few sales… and you can click from this blog to there, if you’re curious. 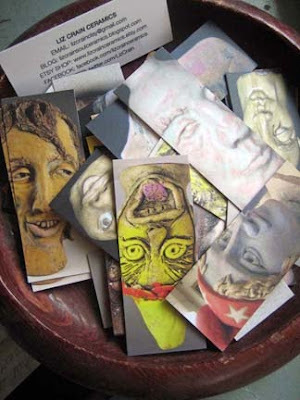 Enter MOO Minicards, snappy graphic snippets of your own works, which I first saw in February at Alyson Stanfield’s Hollister Workshop with the delicious art of Princess Simpson Rashid on them. I envied them mightily and bookmarked the MOO.com site. I had a small wooden bowl of MOOcards for my visitors and it felt like offering everyone their favorite candy. No sales pushiness, just an outright gift from me to them, given and taken with love and delight. I had also bought, assembled and displayed the MOO Mosaic Frame. 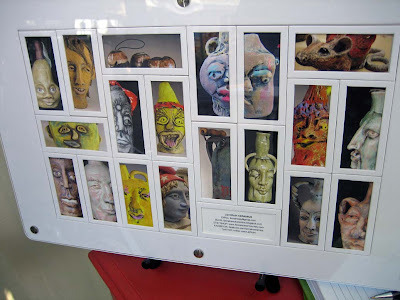 It is a compelling way for visitors to take in your body of work at an informing glance. It functions quite well as a visual Interpretive Message. We just can’t expect even those who have made the effort to come to your exhibit, to ‘grok’ the totality of what you’re puttin’ out, never mind hoping they have the time to page through your portfolio or stand in front of your digital picture frame as the images glide by. All-at-Once Eye-Bites are in order and the MOO Mosaic Frame does that well. When a dear collector bought an elegant face jug I was really proud of, I tucked both a photo greeting card AND a MOOminicard of it in the bag. It felt better than right. It felt natural: as natural as hand-lettering and watercolor-washing my cards in the 70s, but with five ways to continue the conversation with me on the back. (And S, if you’re lurking here…I dare you to leave a Comment.) Now that’s a two-way gift!